Review: Ink is a cute little girl with the appearance of an elementary school girl. However she is already attending high school and her grades are top of the class. She is in love with a boy from her class but she is very shy when dealing with him. One day she meets a powerful mage of a different universe who was banned into the human world in form of a stuffed animal. He lends Ink the power to transform into a magical girl in order to help people in need, which includes helping the boy she loves with his English studies. 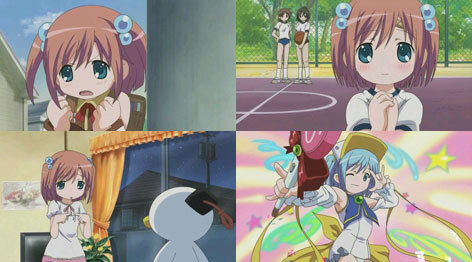 Moetan is an incredibly cute and funny comedy show which is based on an English study guide book for otakus. 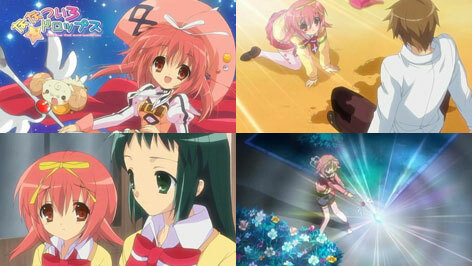 It also has some fanservice and is definitely not the typical mahou-shoujo story but rather a parody of it. Review: Tsuwabuki Masaharu isn’t socializing with his classmates very much until the day he joins the gardening club with 2 girls from his class. One day he accidently drinks a magic potion that turns him into a stuffed animal at night. He can only turn back to normal when a „special person“ helps him to collect star drops that fall from the sky. That person turns out to be one of the girls from his class and now every night she turns into a magical girl and helps him collect those star drops. The settings of this show do not seem very creative, but the characters and animation quality makes up for it. It’s a story about love, friendship and magic. Review: When Haruhi was young she was saved from bullies by a boy who used a beautiful magic spell. Even since then she has been all excited about magic. Today she visits the Magic Section of her high school and has become an excellent mage. On her way home see meets a boy from the Normal Section who somehow reassembles this boy she met when she was young, but he does not want to have anything to do with magic. This evening a fire happens at school and as a result the students of the Magic Section have to share class with the students of the Normal Section. Will Haruhi be able to meet this boy again?